The French Revolution (French: Révolution française) was an influential period of social and political upheaval in France that lasted from 1789 until 1799, and was partially carried forward by Napoleon during the later expansion of the French Empire. The Revolution overthrew the monarchy, established a republic, experienced violent periods of political turmoil, and finally culminated in a dictatorship by Napoleon that rapidly brought many of its principles to Western Europe and beyond. Inspired by liberal and radical ideas, the Revolution profoundly altered the course of modern history, triggering the global decline of theocracies and absolute monarchies while replacing them with republics and democracies. Through the Revolutionary Wars, it unleashed a wave of global conflicts that extended from the Caribbean to the Middle East. 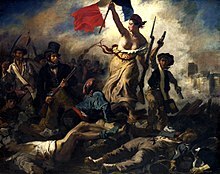 It was the French and not the American Revolution that set the world on fire, and it was consequently from the course of the French Revolution, and not from the course of events in America or from the acts of the Founding Fathers, that our present use of the word "revolution" received its connotations and overtones everywhere, this country not excluded. Hannah Arendt, On Revolution, 1963. There is clear truth in the idea that a struggle from the lower classes of society, towards the upper regions and rewards of society, must ever continue. Strong men are born there, who ought to stand elsewhere than there. For Men of Letters, as for all other sorts of men. How to regulate that struggle? There is the whole question. To leave it as it is, at the mercy of blind Chance; a whirl of distracted atoms, one cancelling the other; one of the thousand arriving saved, nine hundred and ninety-nine lost by the way; your royal Johnson languishing inactive in garrets, or harnessed to the yoke of Printer Cave; your Burns dying broken-hearted as a Gauger; your Rousseau driven into mad exasperation, kindling French Revolutions by his paradoxes: this, as we said, is clearly enough the worst regulation. The best, alas, is far from us! It was the best of times, it was the worst of times, . . . it was the spring of hope, it was the winter of despair, we had everything before us, we had nothing before us. Note: The opening words of Charles Dickens’ literary masterpiece A Tale of Two Cities skillfully contrast how events can affect our thinking, our feelings, and our outlook. The two cities referred to were London and Paris during the turmoil of the French Revolution. For the oppressed citizens of 18th-century France, the revolution’s proclamation of the rights of man was indeed a “spring of hope.” But for those of the ancien régime, or the outgoing political system, it was a “winter of despair,” leading to death and destruction. Benjamin Disraeli. Coningsby, Book IV, Ch. 13. Do not smile at my advice -- the advice of a dreamer who warns you against Kantians, Fichteans, and philosophers of nature. Do not smile at the visionary who anticipates the same revolution in the realm of the visible as has taken place in the spiritual. Thought precedes action as lightning precedes thunder. German thunder is of true Germanic character; it is not very nimble, but rumbles along ponderously. Yet, it will come and when you hear a crashing such as never before has been heard in the world's history, then you know that the German thunderbolt has fallen at last. At that uproar the eagles of the air will drop dead, and lions in the remotest deserts of Africa will hide in their royal dens. A play will be performed in Germany which will make the French Revolution look like an innocent idyll. Heinrich Heine (1797–1856) "The History of Religion and Philosophy in Germany"
Since the outbreak of the French Revolution, the world has been moving with ever increasing speed towards a new conflict, the most extreme solution of which is called Bolshevism, and the essence and goal of Bolshevism is the elimination of those strata of mankind which have hitherto provided the leadership and their replacement by world-wide Jewry. Adolf Hitler, Memorandum on the Four-Year Plan, August 1936. Quoted in Anthony P. Adamthwaite, The Making of The Second World War,	Routledge 2013, (pp. 164-5). According to my judgement, the French Revolution and the doings of Napoleon opened the eyes of the world. The nations knew nothing before and the people thought that kings were gods upon the earth and that they were bound to say that whatever they did as well done. The war which is being waged today by the German armed forces under the highest command of Adolf Hitler is a war of an immense reform. It does not only overcome the world of ideas of the French Revolution, but it also exterminates directly all those racially infecting germs of Jewry and its bastards, which now since over a hundred years could develop without check among the European nations. Alfred Rosenberg, “The Jewish Question as a World Problem,”, Radio Broadcast, 28 March 1941. Quoted in Roderick Stackelberg, Sally A. Winkle, The Nazi Germany Sourcebook: An Anthology of Texts. Routledge, 2013 (pp. 337-8). Mark Twain, A Connecticut Yankee in King Arthur's Court, 1889. From 1789 to late in 1791 the French Revolution was an orderly process, and from the summer of 1794 the Republic was an orderly and victorious state. The Terror was not the work of the whole country, but of the town mob which owed its existence and its savagery to the misrule, and social injustice of the ancient regime and the explosion of the Terror could have happened only through the persistent treacherous disloyalty of the royalists which, while it raised the extremists to frenzy, disinclined the mass of moderate republicans from any intervention. H. G. Wells, The Outline of History, Chapter 36, "The New Democratic Republics of America and France". More lives were wasted by the British generals alone on the opening day of what is known as the Somme offensive of July, 1916 than in the whole French Revolution from start to finish.